Hatch Maternity Review: Is it really worth it? Hatch was one of those brands I heard about even before I got pregnant, so when I did get pregnant I decided I wanted to try them out to see what all the hype was about. But have you seen their prices?! Their tops range in the $100s while their bottoms and dresses are in the $200s. And I could not just see myself spending that much on maternity clothes, even if their slogan is For Before, During, and After. 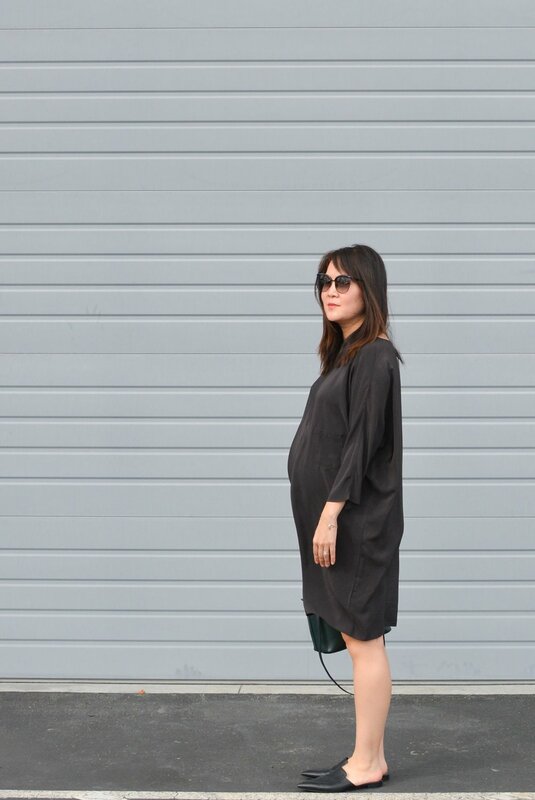 Who are we kidding, I won’t be wearing maternity clothes after the baby is born, I’m going to jump back into my Elizabeth Suzann Clydes and Everlane-everything-else. So The RealReal to the rescue (you can read about my TRR purchasing experience here). So by purchasing Hatch items secondhand on TRR, I was able to try out pants and 2 dresses for about $40-$60 apiece. So I’m not even going to show you the pants because it was dang awful. The fit was bad, the material was bad, everything was bad. But I will show you the two dresses I tried on. 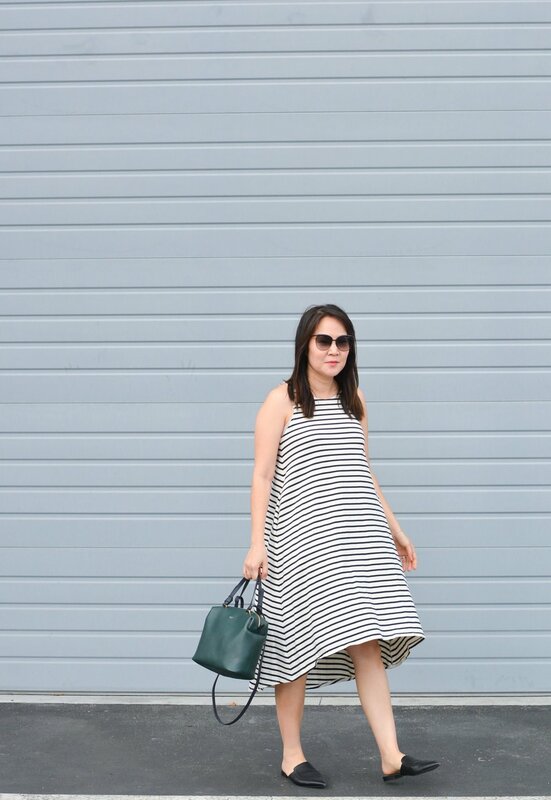 First up the striped Nantucket Dress, which I kind of loved until I took outfit shots with it. I’m a bit too short for this dress and it makes my legs look stubby especially from the side and back because of the dipped back hem. Wearing heels would make this dress fit better proportionately but I’m not about to wear heels when pregnant. And since I didn’t love it, back this dress went. But the construction was really good and it was made from a very thick and sturdy 100% cotton material. This particular dress was made in New York and thus presumably made ethically (if following US law) though not all of Hatch’s current items are (more on this below). The next dress I tried on was an older silk piece from when Hatch was an offshoot of the Hatch founder’s first line, TwoBirds. I’ve noticed that most of the offerings on Hatch currently are blended with plastic (polyester) which makes the garments cheaper to produce. But the prices are still quite high for garments blended with such “fillers”. Since shopping mostly ethical and slow fashion, I’ve really paid attention to fabric content and only buy clothes made of 100% natural fibers (cotton, silk, wool, etc.) since not only does that mean the garment is of a higher quality, but they are also fully biodegradable at the end of its life (100% natural fibers are also more expensive so you’re getting better bang for your buck). There are very few pieces in Hatch’s current collection that’s 100% silk so I jumped at the chance to try this very old Hatch piece from The RealReal. I would say the silk quality here is pretty good, at about the same level as Cuyana’s silk items (but not as good as say Elizabeth Suzann’s silk). This item was also made in New York. But I’ve noticed that many pieces from Hatch’s current collection are no longer made in New York, and instead are made in China (so I don’t get why such the high prices like this dress, the one Meghan Markle wore). A polyester viscose dress made in China at most cost them around $30 to make (loosely based on Everlane’s transparent pricing of their triacetate dress here), so charging over $200 seems excessive. 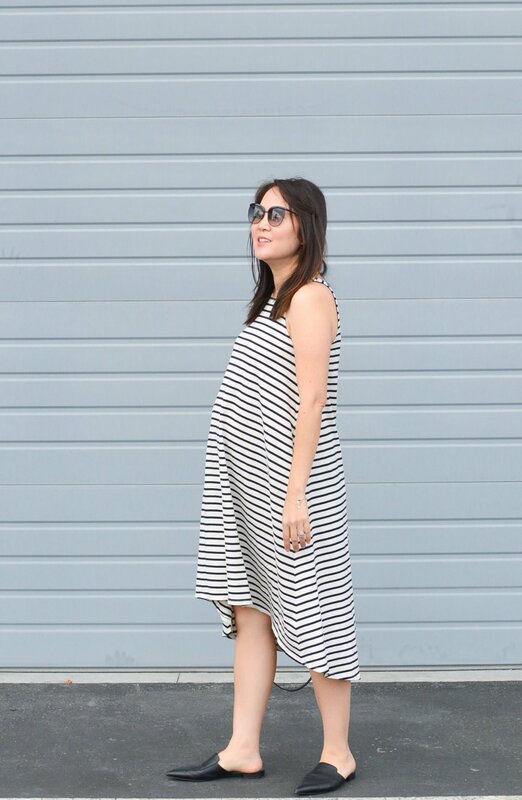 So would I recommend Hatch clothing for expecting mothers? No, to me it’s not worth the price. Like I said before getting it secondhand makes it slightly more worth it, but I think there are other maternity clothes designers out there that produce better items at better prices (especially since Hatch is not necessarily producing their items in a social or environmentally responsible way—which you know is important to me). I think when you buy something from Hatch, you’re paying a lot for the brand name and not for the quality and design of the product. Stay tuned for another review of a maternity brand that I liked much better and found to be of a better value! Have you guys tried Hatch and what did you think?